Anything that brings people of all races, ages and backgrounds together is a good thing. When it includes entertainment for all, it’s a great thing. Port St. Lucie Community Band is a wonderful example, whether young or old, bald or blue-streaked. The band personifies “community” as it celebrates 30 years of entertaining the public. 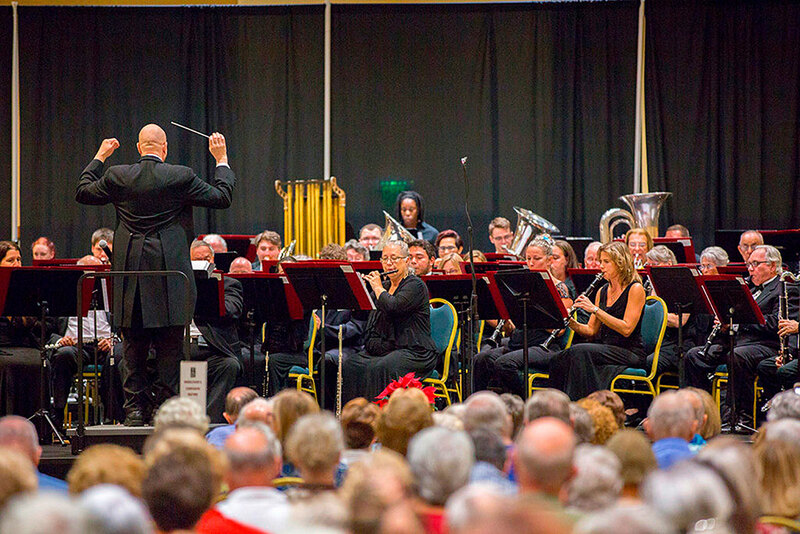 Conductor John K. Southall, Ph.D. is also the music director at Indian River State College, president of the Florida Music Educators’ Association and past medal recipient for excellence in music education. Under his leadership the band combines the talents of middle school and high school students, adults from all walks of life, retirees and snowbirds. Arriving a bit late for rehearsal, just in from a conference in Dallas, he apologizes. “This is my heart and soul,” he says. The mutual affection between conductor and band is evident. Andre Bernier hails from Sherbrooke, Quebec, and met his wife of 42 years through music; she is a pianist. The retired electronics teacher plays tenor and alto sax, not only with the Community Band but also with one of its offshoots, the Ambassadors of Swing, and another group in Vero. Okeechobee High School junior Makaya Whitehead is 16 and has been playing the trumpet since seventh grade. Driving 45 minutes each way, she brought schoolmates Derrick Chen and Ethan Adabo. Talented musicians, they wanted something more challenging; being part of the Port St. Lucie Community Band is like taking a college music course. Flutist David Mook lives in Fort Pierce. A former oceanographer and geologist, Mook taught at Barry University. “I started playing in grade school and later took a hiatus because of work.” Enjoying retirement and travels, he is a long-time member of the band. “I’ve been with the band since the earth cooled,” he jokes. Supported by grants and ticket sales, the band is a non-profit organization; donations are tax-deductible. There are about 70 members of the band; others come and go. “It’s like a big family,” says band president Pat Vaida, welcoming a member back for the winter, then introducing the newest musicians and guests. The retired teacher’s aide also serves as the band’s librarian. Vaida puts down her trumpet to tend to librarian duties. “Most of our concerts are at the Port St. Lucie Civic Center,” she says as she sifts through music folders. Occasionally, they’re asked to perform at other venues. Once in a while, they have a combination concert with IRSC’s band. Several IRSC students double as members of the band. Band members mill around the room during the break, telling jokes or introducing themselves to newbies. The percussionists stay near the back. Port St. Lucie’s Ed Shank recently retired as a music teacher in Connecticut and moved here full-time. His T-shirt gives a sense of his identity: It’s OK, I’m With the Band. During rehearsal, he was joined by newcomer Joseph Feliciano, a 13-year-old student at Southern Oaks Middle School. Side by side, they added musical interest to a rendition of “Sleigh Ride” with bells and the “whip” sound of a wooden slapstick, or took turns playing the xylophone. During that same number, Port St. Lucie pharmacist Kyle Green took a break from the standard drum set to supply the sound of horses’ hooves clopping down a country road by playing the temple block. Formerly in the Marine Band, he worked with someone who invited him to a rehearsal; he’s been active ever since. “It’s a lot of fun,” he says. Robert Back is at this particular rehearsal to support his son, Alex, a trombone player at Oak Hammock K-8. Alex didn’t grow up with a love for music, but one day he said he wanted to be in the band. Alex’s band director, Amy Isenhour, is also a member of the Port St. Lucie Community Band; she encouraged him to check it out. The Port St. Lucie Community Band may be voluntary and friendly, but when it comes to performance, it’s all business. At concerts, the men wear tuxedos while the women dress in all black. The banter stills, now that they are in the public eye. Every motion of the conductor’s wand is crisp and purposeful. The arms raise, and all is quiet as the band takes a collective breath, and ... music.